Before we start, I just wanted to let everyone know that this weekend we will be heading to our trailer at the campground and then moving it to our family cabin. We will be gone until the Monday after Thanksgiving. And during this time I will not have any access to the internet. So, I don’t want anyone thinking I am ignoring them but, I won’t be able to visit anyone while I am gone. Since I will be gone and next Thursday is Thanksgiving we won’t be having Thrifty Things Friday party. This is going to be so weird for me. I have been blogging for almost 4 years now and this will be the longest I have ever been away from my blog! When I think about it, this will be the longest I have ever been away from the internet in almost 6 years! Holy Cow! I used to work for a company online so, even then, I had my laptop and worked “from the road” when we took vacations. How cool is that! Not only did we get these weird gourds but, they all went nuclear in size! No little cute gourds this year. Nope, we got big ‘ol honkin’ ones! I figured these would be fun to decorate outside with. And so I started placing them around here and there and realized I need some kind of foliage. Normally I would go and buy some mums and cornstalks. but, this year, I am spending NO money on outside decor. I looked around our yard and realized I needed to do some serious cutting back on flowers and whatnots. The flower bed needed to cut back and I realized that the dead flowers are pretty in their own right and could be used to decorate with. What you see here is in the front right corner corn that has been growing. Why did we plant corn in front of the doorwall? We didn’t. There is a bird feeder right above that and it seeded itself. And in the background that is Mugwort. It is an herb and grows like crazy. Both of these needed to be cut down so, what the heck?! The side yard with the old white (free curbside pickup finds a couple of years ago) wicker. The white trellis in the background was also a curbside pickup. The metal birdhouse was a thrift store buy for $1.00 a couple of years ago. I usually have a potted flower in it during the summer. We have these two pale yellow wood chairs (thrift store ~ $7.00) in front of the flower bed with an old white rusty wire stand (free curbside pickup) between them. The copper bird candle lantern was a thrift store find for $1.00 years ago. It is quite rusty now having been outside all these years. But, I like that look. Okay, so it’s not magazine perfect. But, I like the way it turned out. And the very best part is I did not send a dime! Let’s take a look at a couple of fun links from last week! I think is is going to be a Kitchen Redo Feature! Did you check out this wonderful kitchen redo at a great thrifty budget at Scribbler Unfocused? If you want some ideas to redo your kitchen without spending a fortune, head over and get some inspiration! And Kathe over at Kathe with an E showed how amazing new paint can totally transform the look of your kitchen! Way to go ladies! I hope you will grab the “I was featured” button below! Okay, let’s party the thrifty way! I love all of your gourds! I have seen this around town here too. They are plentiful this year with all of the rain we've had. Thanks for having us over! Awesome gourds, are you kidding they came up as volunteers?!?! You did a fantastic job creating vignettes with them. And thanks for hostessing another great party! Super beautiful photos Diann..love all the fall gourds and garden shots...so pretty! !Beautiful!I'll have to hop on this party some time soon..sounds fun! I hope you enjoy your Thanksgiving and have a great time with your family! My camper is winterized and still at the campground where it'll be waiting for me in the springtime. Happy Thanksgiving. Love those free gifts from the compost, Diann! Very thrifty! I don't think the link worked for my pic, I am going to try again. I think your outside decor IS magazine perfect. Don't be surprised if you get a call from BH&G!!! Thanks for the party!!! I LOVE your chairscapes. BEAUTIFUL. Have a wonderful time away from the internet. We all can use a technology break once in a while. HAPPY THANKSGIVING. Take care. I have never been featured any where before, so I feel like I have arrived. Enjoy your time "unplugged" and we'll see you when you get back. Your photos are beautiful, you did great! Happy Thanksgiving to you and yours! Diann I think your outdoor decor looks great and I really love the price....FREE! Good job. I'm trying to cut back on buying anything right now but some Christmas gifts. Still a girl has to thrift once in awhile! Have a wonderful Thanksgiving! How weird to be away from a computer that long...boy have times changed! Enjoy your family and give T & L a hug from me. What warm autumn images! The kitchen make over is inspiring, too. 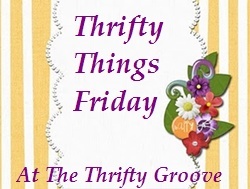 Happy Thrifty Things Friday. Diann, what great decor for outside! So pretty and seasonal! You have showcased some great features. Thanks for hosting. I'm glad to link up! Thanks for hosting -- I'm enjoying all the link-ups this week!